Over two decades have passed since Netscape went public in 1995, triggering the revolutionary ability to browse websites. It also spurred the multi-billion dollar investments by companies like Global Crossing in the creation of undersea and underground fiber-optic telecommunications cable networks, which in-turn drove down the cost of data transmission to nearly zero. Browser wars led to Y2K led to the dot-com crash giving birth to hacktivism, social networking, the blogosphere, the deep web and everything else. The internet has enabled open-sourcing, collaboration and innovation that even the most idealistic dreamers could have never imagined. And because we’ve all grown up within the infinitude of this burgeoning digital universe, we’ve grown to take unspoken digital liberties for granted. Each computer effectively functions as a neuron in the massive brain of what was previously referred to as the World Wide Web. As with a hive, it is not the neurons themselves, but the connections between individual neurons that create intelligence. In allowing connectivity between computers and thus individuals, the internet has allowed for explosive leaps in awareness worldwide. The internet likely represents the last effective tool that remains with which to oppose forces of despotism in our rapidly globalizing landscape. Unlike Corporate controlled media where the wealthy have dominated our access to information, our ability to organize, and our means of earning a living, the internet represents a force for actual democracy on a level playing field. We can attribute such liberty to Net Neutrality, which we are told officially ended this week. Near the beginning of the internet’s inception, the FCC put into place a regulation to guarantee an open and free internet. Part of that clause is called Net Neutrality, which regulated Internet Service Providers from differentiating between one site and another. Corporate ISPs want more money, and want to charge premium fees for the websites we visit. 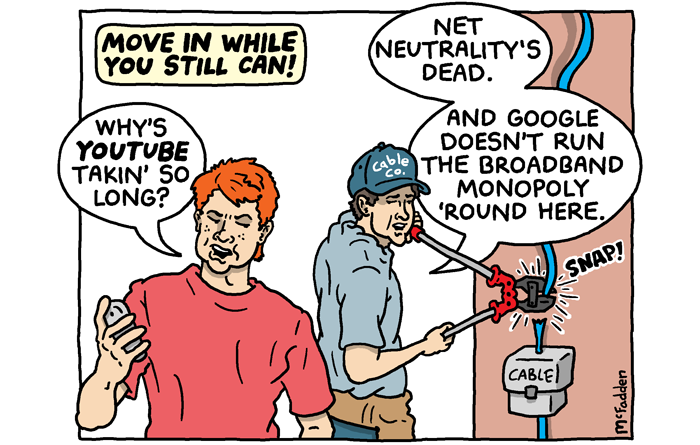 But they can’t do this as long as Net Neutrality rules remain in place. As the rules have stood for decades, ISPs cannot prioritize data on a pay-to-play system of browsing per the Title II classification of Internet Service Providers (ISPs) as common carriers. But ISPs have lobbied hard, even placing their own people into the FCC, in their constant crusade to revoke Title II restrictions. 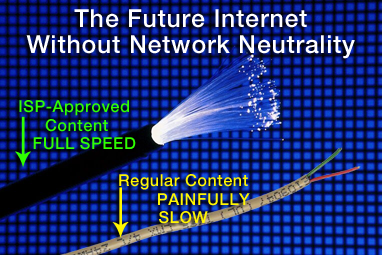 If they are successful – if Net Neutrality dies – ISPs would be granted complete power over the internet, including the ability to outright ban certain websites on their network. Given the possible profits and power that await ISPs following the death of Title II, it is not particularly surprising that companies like Comcast, Time Warner and Verizon have pulled out every possible legal trick in the book to to overturn Title II, and now it looks like they might actually succeed. As soon as next month, the net could become the exclusive plaything of the biggest such corporations, determined to squeeze as much profit as possible out of bandwith. Meanwhile, the tools to help us engage in critical thinking, dissent and social mobilisation will be taken away as “net neutrality” becomes a historical footnote, a teething phase, in the “maturing” of the internet. The FCC, who are supposed to act as a regulator, actually protect telecom industries by proposing “reforms to Net Neutrality.” The current chairman of the FCC, Ajit Pai, was served for many years as a lawyer working for the telecom giant Verizon. 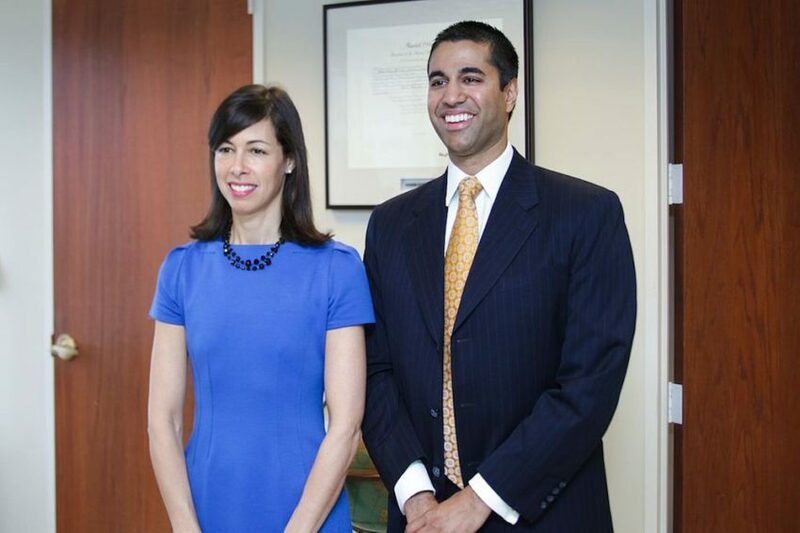 President Trump appointed Pai in 2017, but the proposed death of a free and open internet goes far beyond the Donald’s presence in Washington. The Obama Administration’s FCC Commissioner Tom Wheeler – who attempted to gut Net Neutrality rules in 2014 – was also a former cable industry lobbyist sponsored by Comcast, Verizon and the US Telecommunications Association, and hired Comcast Attorneys Daniel Alvarez and Matthew Del Nero during his tenure. 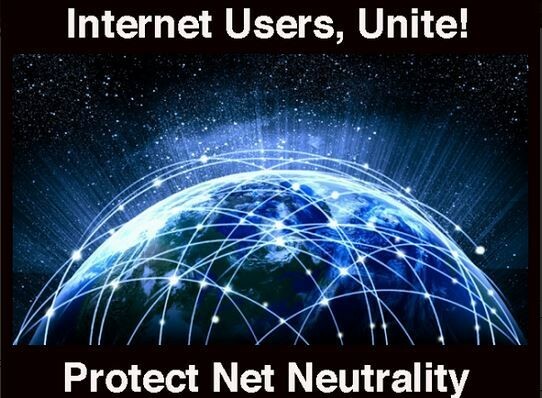 In January Montana Governor Steve Bullock (D) responded to theFCC’s vote to end Net Neutrality by signing an executive order requiring internet service providers with government contracts in the state of Montana to abide by Net Neutrality rules. The order makes his state the first to push back on the Federal Communications Commission’s decision to repeal the open internet rules last month. “There has been a lot of talk around the country about how to respond to the recent decision by the Federal Communications Commission to repeal net neutrality rules, which keep the internet free and open. It’s time to actually do something about it,” Bullock said in a statement. The order says that in order to receive a contract with the state government, internet service providers must not engage in blocking or throttling web content or create internet fast lanes. Those practices were all banned under the Obama-era 2015 net neutrality order. On the one hand, the FCC insists that it has the authority to ban states and cities from establishing public alternative networks. Since ISPs enjoy natural monopolies — there’s only so many poles and sewers to go around — most cities have one or two ISPs, and if both of them refuse to adhere to net neutrality principles, the state would seemingly have to go without internet service altogether. The question will be whether one of the duopolies in a city with government offices will betray its network discrimination conspiracy with its “competitor” in order to land state contracts — or whether the state will build out its own government network, something that the FCC seems prepared to permit. 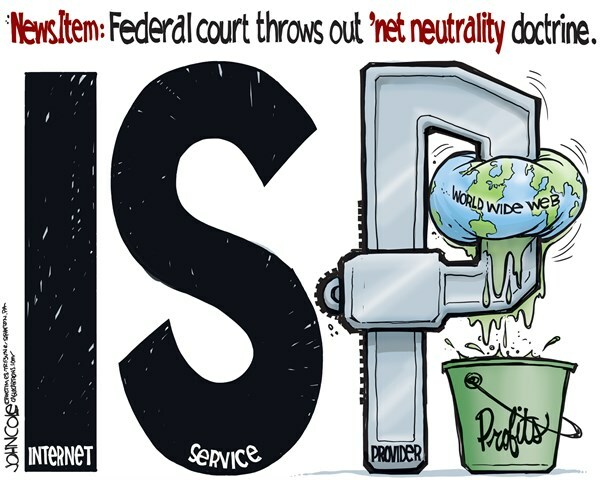 In a Washington D.C. Court of Appeals case – Verizon VS The Federal Communications Commission – rulings effectively put an end to Net Neutrality already, abolishing FCC regulations over telecommunications giants like Verizon and Comcast, Cox, AT&T, and Time Warner Cable. Now we’re facing the complete repeal of already compromised regulations, and we’re set to witness that repeal as soon as December of 2017. 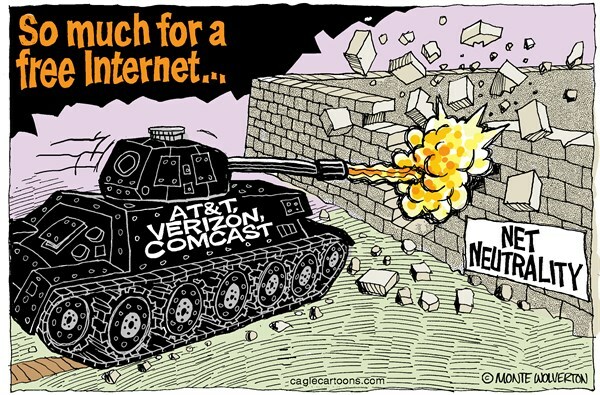 Under the Appealed ruling, ISPs can already selectively censor the internet by throttling sites they don’t like into nonexistence, hindering cash-strapped internet start-ups from getting off of the ground, stifling innovation, killing off new competitors challenging massive corporations, and widening gap between the haves and have nots. Now income inequality threatens last bastion of free speech. Small businesses, nonprofit organizations, independent journalists and the like, will not be able to afford to pay for the “fast lane” of the internet. ISPs will be able to discriminate between data on the final mile before the data connects to your home. The new tolls would allow ISPs to actually tax internet companies for the “privilege” of connecting with customers who are already paying for network access. Small business owners and everyone else won’t be able to compete with massive corporations. Start-ups won’t be able to compete with the pay-to-play fast-lane. 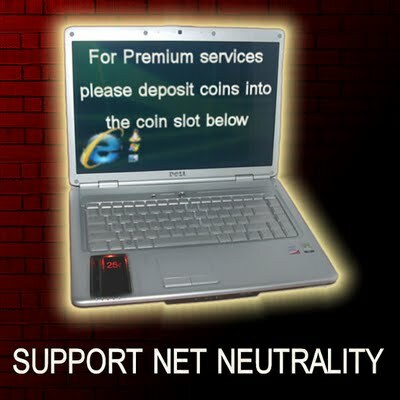 An end to Net Neutrality would grant ISPs the ability to give some websites preferential treatment (faster traffic) in exchange for money. But who has all of the money in the first place? The name of the game is Pay To Play. 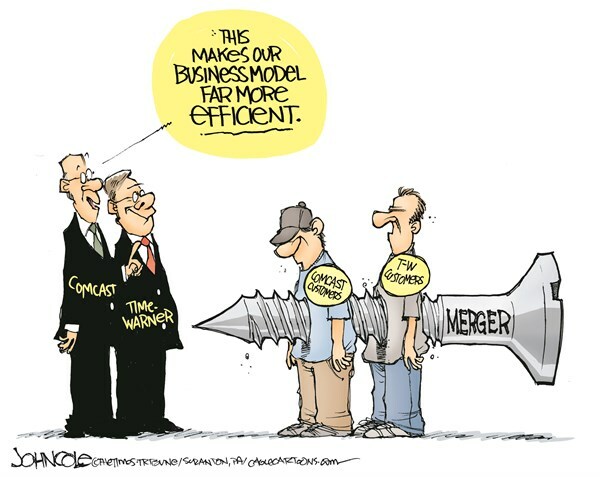 ISPs will be able to manipulate broadband speeds based on which organizations are willing to pony up the most dough. Our voices will become inaudible in the sea of money that has bought politicians and saturated our mental environment with the pollution of incessant advertisements for generations, literally drowning out our voices on the only frontier we have left. Then again, wasn’t it really just a matter of time before this happened? The internet, after all, poses a significant threat to all corporate agendas. But for those of us who have come to take these services for granted, it is a sad reminder that we don’t truly know what we have until it is gone, as the old saying goes. “Some recent commentary has had a misinformed interpretation of the Open Internet Notice of Proposed Rulemaking (NPRM) currently before the Commission. There are two things that are important to understand. First, this is not a final decision by the Commission but rather a formal request for input on a proposal as well as a set of related questions. Second, as the Notice makes clear, all options for protecting and promoting an Open Internet are on the table. The courts have explicitly ruled they have the authority to change this classification, which is why they moved internet from Common Carrier classification to Information Provider, akin to any other public utility. As billions of people from different cultures are being brought into a brave, new, globalized economic landscape, the monopoly of the Anglo-American world Empire is being challenged on a daily basis by this online network of networks. But the internet doesn’t only challenge the Empire from the outside. While disinformation propaganda has filled our minds with lies for decades, the alternative media challenge the dogmatic information monopoly of corporate owned organizations like CNN, FOX and MSNBC. The internet has made it impossible for the established regime to sell propaganda to us; if the mainstream media attempts to convince us that the people of Iran are inherently evil to sell another illegal war to the American people, we can simply access the web to engage in conversations with Iranian citizens, and in doing so we ultimately arrive at the conclusion that those people in Iran are really no different from us, and desire the same things that we do. Thus the internet shows us not only that we are all connected, but that we are all one consciousness. According to complexity theory, when simple things interact, they create unpredictability. It is expressly this unpredictability which threatens the hegemony of the Corporate state.The Corporatocracy has ten-thousand reasons to loathe a free and open internet, which is why they’re attacking it from all sides. While Microsoft and Macintosh’s computer systems have been intentionally designed with built-in back doors to NSA and GCHQ servers, open-source software like Linux challenges the dogmatic surveillance monopoly of corporate owned intelligence organizations like Booze-Allen-Hamilton. While Wal-Mart and Target drive out local businesses and bring mom-&-pop shops to their knees, eBay stores and the 3D printing revolution of thingiverse.com and the like challenge the dogmatic production monopoly of corporate owned retail outlets. While our banking systems choke out local economies and foreclose struggling families from their homes with the stranglehold that is compounded interest, Bit-Coin and other Crypto-Currencies challenge the dogmatic monopoly of the Central Banking System’s fiat currencies. The radio program you’re listening to at this very moment is yet another shining example of why the internet is so important. Without the web, this show does not exist, plain and simple. 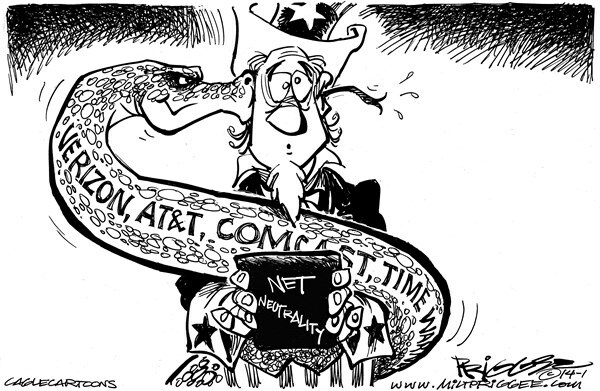 So its not hard to understand why the Corporate elite are doing everything they can to destroy internet sovereignty. The Corporate elite view internet as something akin to Pandora opening her box. In the early days of internet regulation bills, Senator Jay Rockefeller actually said to a crowded auditorium on the subject of cybersecurity, “Would it have been better if we had never invented the internet?” Our Corporate masters are desperate to stuff the genie back into the bottle, and shove the cat back into the bag. But a mind expanded by new experience can never return to its previous dimensions, and now that the standard has been set, a reversal of the information trend will not be tolerated by the online community. Every day the internet exists, it becomes stronger, striking fear into the black heart of the oligarchs. As the old saying goes, all good things must come to an end, and we may be witnessing the death of the internet as you read these words. The rich are attempting to control the internet by buying it, creating a new form of classism, what might be termed Digital Apartheid. If they succeed, the rest of us too poor to afford the perks of the free internet we’ve all come to take for granted, will become second-class digital citizens, unable to access information we were able to before. They don’t have to shut down websites to kill the internet. 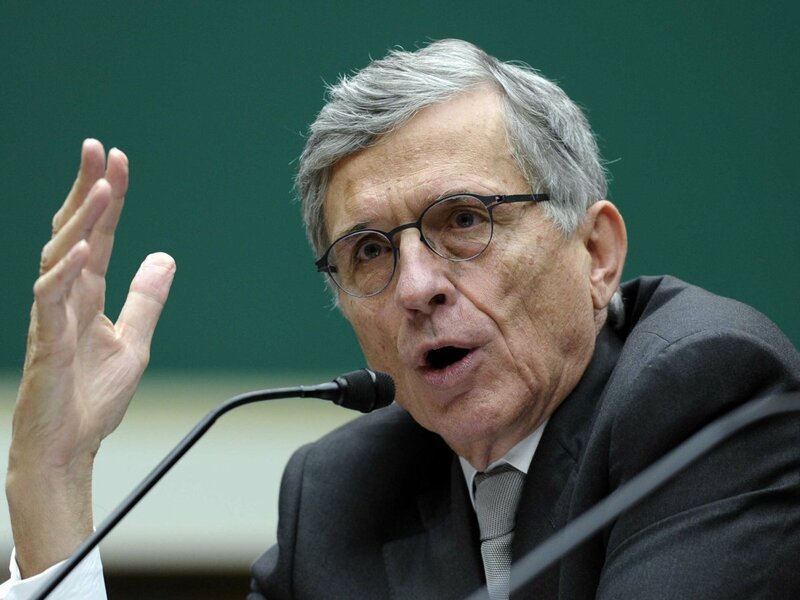 All they have to do is put an end to Net Neutrality, which is exactly what FCC Chairman Tom Wheeler announced was going to happen this week. The websites we access on a daily basis constitute the accessible internet, and Internet Service Providers or ISPs must provide equal access to everything that is online to their clients. Net Neutrality means that your Internet provider cannot limit what you view online in any way. If it is online, you can access it. But let’s put this into perspective. What would net neutrality look like if it were applicable to telephones? It would mean that I can call a business as easily as I could call an individual. An end to telephone neutrality would mean that I could easily get through to big businesses, but would have to wait long periods of time in order to contact acquaintances, ultimately culminating in negative effects, like being put on hold for a 911 call. The bottom line here is that you cannot value communication technology on a sliding scale, although this is expressly what the end of Net Neutrality will create for us. They’ve written a number of dress-rehearsal internet control bills, all of which were shut down by popular activism. ACTA failed. SOPA failed. PIPA failed. CISPA failed. 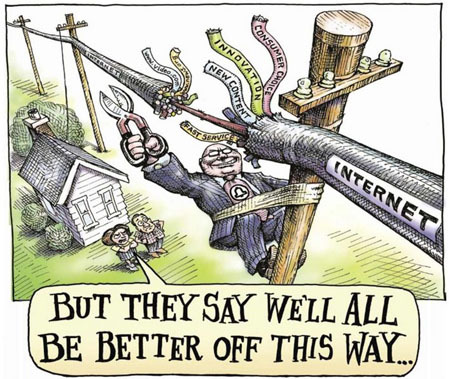 And now with the TPP floundering in the water, it is clear that outward control of the internet is not going to work. The NSA is apprehensive to activate Quantum Copper, which is essentially the Great Firewall of China for the entire global internet, for fear of the backlash. If they suddenly shut off the internet, what would happen? They’ve discovered that they can’t control the internet openly, so now they’ve decided that it might be a good idea to exclusify information by forcing people to pay for it. Since people are barely able to make ends meet in the first place, the internet has become their only saving grace to make the rent and pay for groceries. So the idea of making people pay more for basic access on a sliding scale will break the back of our world wide web even more effectively than outwardly controlling it. When it comes to these rulings and legislative efforts, the last people who are involved are we the people. The lobbyists and congressmen who have no conception of what the internet actually is, are writing this legislation not only for the sake of increasing their profits, but to control the even distribution of information that challenges their establishment narratives. They’re turning this into a tiered system like cable television. These new data limits would likely be sold to us based on packages. For example, if you would like the social media package (which includes facebook and google+), you’ll have to pay an additional $9.99 in addition to the connection fees associated with your ISP. If you’ would like the streaming video package (which includes youtube hulu, and vimeo), that will cost you another additional $19.99 since steaming services require lots of bandwidth. And if you want to see smaller sites (like outerlimitsradioshow.wordpress.com) which aren’t included in these packages, you’ll just have to eat away that data. And if you’re dissatisfied with the fact that your service is slow, pay more to get faster service. Can’t afford it? Tough luck. Hope you enjoyed an open and free internet while it lasted. For the average internet user, this means that our favorite sites would take forever to load (especially if the corporations deem them a threat to the established propaganda narrative) resulting in even higher fees, justified by higher traffic and high bandwidths. IS IT WORTH THE FIGHT? How much longer are we going to waste our energy stopping programs that should not exist? Putting a stop to insane bills and ludicrous laws? How much longer will we read about the abuses of corporations in our headlines and think to ourselves – “this has to be stopped?” Why do we tolerate this? Occupy this. March for that. Instead of building a future on the altar of our most glorious dreams, we spend our time protesting and demonstrating, signing petition after petition, wasting all of our time and energy to stop programs and initiatives that should never have been conceived of in the first place. We’re on a hamster wheel, running harder and harder and expecting different results; expecting to go somewhere. We told ourselves that if we could stop SOPA the government would get the message and leave the internet alone. We told ourselves that if we could put an end to CISPA the government would finally get the message and leave the internet alone. But they slither and squirm their way out of every new regulation and ruling. They spend all their time conceiving clever methods of implementing their agenda. How much longer can we keep this up? I’ll give it to these lobbyists, they are very clever, but they’re not very wise. How do they think this is going to end? We are many, and they are few. The power to stop them is in the mirror. The fight is not over, but the time for waiting around to do something is. Take action.